Esli, 19, from Arizona, born in Mexico. I am fair-skinned, speak fluent English without an accent, and came to the U.S. when I was just two years old from Mexico. As a result, a lot of people do not realize that I am an immigrant. My fairer skin grants me an immunity of sorts from the challenges and racial discrimination so many other immigrants face. This gives me a chance to see the world through different pairs of eyes. But, even with this so-called advantage, growing up undocumented was far from easy. When I was 16 years old, many of my peers began to excitedly discuss the prospect of driving a car for the first time. When I asked my father when he thought I should start studying for my Learner’s Permit exam, he grew serious and explained to me, for the first time, that I am undocumented. When I first found out, it didn’t change much in my life. But as I began to apply for college, it changed everything. When I started to look into how I might pay for my college education – as college was always a dream – my immigration status moved from a seemingly insignificant detail to a consuming, serious, and scary fact that could severely limit my future. During my senior year of high school, and throughout the summer leading up to my freshman year of college, I spent this time resisting and resenting the fact that I might have had to go to community college. This is not to say that community college is not an amazing opportunity for so many, or that I would not have been grateful. It just had always been a personal goal and dream of mine to attend a four-year university, specifically Arizona State University. I was not ready to give up on this dream before it started. During this scary period of realization, I was fortunate to have a strong support system in my family as well as in my high school calculus teacher, who played a significant role in helping me get into college. No one – outside of my family – had taken as much interest in my future as did this teacher. TheDream.US made it so I did not have to give up on my dreams. Now I am proud to say that I am the first high school graduate in my family and I am on track to be the first college graduate. Right now, I am not working and focusing only on school, which feels like an absolute dream come true to me. Even in the face of hate and adversity in a turbulent time for undocumented kids in this country, I am unashamed of who I am and hopeful for the future that lies ahead. As a student at Arizona State University, I am pursuing a degree in environmental engineering. It is my dream to build systems that bring fresh and clean water to people living in impoverished and otherwise unfavorable conditions. Fighting inequality of all kinds is important to me, and I believe my degree will translate well to addressing the global population’s unequal access to water, a major public health crisis of today. 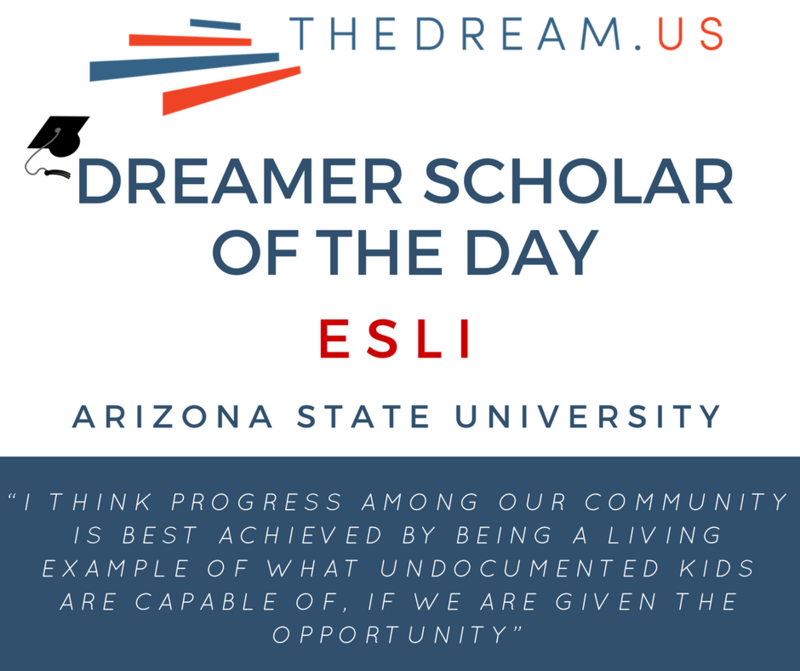 In pursuing this specific and career-oriented goal, I am also mindful and interested in setting an example to other undocumented students. I want to provide that the sacrifices so many of our parents made were not in vain. These sacrifices were not mistakes; these sacrifices gave so many of us the world. I want to help change the stereotypes formed against our immigrant communities, especially undocumented communities. This will require some tough love to inspire others to work hard and break through barriers and challenges associated with being undocumented in this country. Ultimately, I think progress among our community is best achieved by being a living example of what undocumented kids are capable of, if we are given the opportunity.